"there isn't any reindeer, any elves or magic toys." "He's on his way with loaded sleigh to visit us tonight." and I've been good for oh so long, been good for goodness sake." I didn't want to be a man, but promised dad I'd try. the house was never quite the same since dad went off to war. We read about that meany Grinch and cheered when he did right. and tucked the covers to my chin and kissed me on the head. "Don't worry mom," I whispered "things are gonna be all right." "We're sure to get our Christmas Wish when Santa comes tonight." for telltale ring of jingle bells or clop of reindeer hoof. And would have gone to sleep but for the noise out on the lawn. the tread somehow familiar like I'd heard it once before. the silhouette that stood alone before the Christmas tree. the heavy sack a duffle that he placed upon the ground. And not a single jingle bell, just medals could be seen. For Santa came on Christmas night and brought me home my dad. 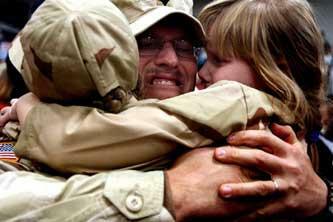 Wow, My husband did the same -- came and surprised me and my son for Christmas from Iraq. What a great poem and message!! I do believe in Santa as well, but know that someone on high is watching over our troops and their safe return to their families!! Merry Christmas!